If you listen to many Hammer fans, they will tell you to stay away from this movie. Don’t listen to them. Listen to me, the resident Hammer film completeist. A Hammer film directed by William Castle may sound like an unsettling mixture. Well it is, but that’s a good thing! (God, I sound like Martha Stewart). This film really shares very few characteristics of the old Universal tale, but that is no matter. This film is one of those delightful horror comedies that aren’t laugh-out-loud funny but still very amusing. The film begins with a very odd conversation between Tom Poston and Peter Bull. We discover the two men are roommates but have very strange living arrangements. Tom’s character (Tom Pendrel) lives in the house at night and Peter Bull’s character (Casper) lives in the house during the day. We get the feeling that Casper is a little “tapped”, and he mysteriously invites Tom to his “night” house. Of course, when Tom arrives, Casper is dead. Casper’s family members are a couple beans short of an enchilada, and inform Tom a very strange tale of their family. Apparently, a wealthy descendant left the family with all his riches, however, they must stay in the house every night or they lose their rights to their part of thefortune. The fortune can only be touched by the last survivor of the family AND the house is destroyed. Naturally, a killing spree starts and poor Tom (who’s stranded there because his car broke down) is caught in the middle. This film is a William Castle film, so it is amusing. 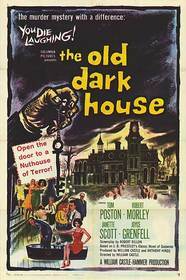 This film is very similar plotwise to House on Haunted Hill. It’s also a Hammer film so it’s also has a touch of soap-operaish horror (though never takes itself too seriously due to the comic prowess). The film’s ending is what I call “obviously surprising”, as the killer was perhaps the most obvious person but you didn’t realize it until the end of the flick. If I was to compare this movie with any other film, it’d say it was a pre-80’s Clue. It’s an amusing, zany, whodunit that keeps you guessing until the end of the flick. I must say this film is pretty well-acted (which says something for a Hammer Film that does not have Christopher Lee and Peter Cushing in it). Tom Poston proved to be great in his role of the confused outsider, and I might just have to pick up a couple more flicks that he was in. Not a film for “Hammer Horror Purists”, but those more open to Hammer will find it enjoyable. This is for those who like a little comedy with their horror (Comedy of Terrors and Abbott and Costello monster movie fans will like this little flick). Hard to find, but worth the effort for the right horror fan. Submitted by Peter Dawson (not verified) on Wed, 2009-06-17 07:10. This great 1960's British movie can now be bought from www.hardtofind-dvds.com, which is based in the U.K.